Because software rendering is significantly slower than hardware-accelerated rendering, we're also introducing a concept called "feature requirements" that will help minimize how often O3D will have to fall back to software rendering. Feature requirements allow developers to state upfront that their app will require certain hardware capabilities to render properly. If the machine running the app supports those features, O3D will run it fully hardware accelerated; if however, it is lacking any of the required capabilities, O3D will drop into a software rendered mode. Anecdotally, we found that this tiering allows 45 of our 48 samples to now run in hardware-accelerated mode with less capable graphics cards. Finally, while it has nothing to do with extending hardware support, we're also adding a couple other goodies: a full-screen mode to make O3D apps more absorbing and a community gallery to feature cool demos that use O3D (like Infinite Journey, the first game developed outside Google using O3D). If you've developed an application or sample that would be useful to the O3D community, please be sure to submit it for our team to review for inclusion in the gallery using this form. We're happy to announce that today we shipped a substantial update to O3D, an API for creating rich 3D applications in a web browser. With today's release, we focused on addressing a theme we heard in the requests and feedback from the community: that O3D should run as well as possible on many different types of hardware. Toward that end, we're releasing two new additions: software rendering and feature requirements. If you've already installed the O3D plugin, you should receive these additions automatically. Software rendering allows O3D to use the main processor to render 3D images if the machine running the app doesn't have supported graphics hardware. While the hardware O3D requires to run in hardware-accelerated mode is fairly modest by today's standards (a DirectX 9, Pixel Shader 2.0 capable graphics card), there are nonetheless PCs that don't meet these requirements, and we think it's important for web apps to run on all machines, regardless of hardware. Are you developing free iPhone or Android applications? With our new beta product - AdSense for Mobile Applications, you can monetize your mobile applications by showing contextually targeted ads and/or placement targeted ads alongside your application content. We provide you with iPhone and Android SDKs and example applications that request and display AdSense ads. Our SDKs also support DoubleClick ads. You can show 320x50 text and image ads linked to HTML webpages in your application. These ads are targeted to the keywords that you send us in the AdSense (or DoubleClick) ad request. The keywords must be relevant to your application content. If your application content is loaded from a webpage that is customized for iPhones and Android handsets, then you can also send us the webpage URL for us to target ads. The ads may also be placement targeted which means an advertiser can specifically target to your application. Our iPhone SDK is compatible with iPhone OS 3.0, and our Android SDK is compatible with Android 1.5 SDK. The SDKs include a library that can be linked in to your application which exposes methods to fetch and show ads. You must place a maximum of one ad per screen at the top or bottom (see the screenshot from the Backgrounds iPhone application). When a user clicks on the ad in your application, you can choose whether the user should view the advertiser's website in iPhone Safari or a full-screen UIWebView on the iPhone. For Android applications, our API defaults to opening the advertiser's website in the native browser. To get started with monetizing your iPhone or Android application, sign up today on the AdSense for Mobile Applications website. We can't wait to have you join our beta network! indicates that people prefer faster, more responsive apps. Over the years, through continuous experimentation, we've identified some performance best practices that we'd like to share with the web community on code.google.com/speed, a new site for web developers, with tutorials, tips and performance tools. My favorite part about Google I/O is the dozens of interesting conversations with developers -- getting a first-hand look at the different things that they are doing with our technologies. That's the spirit of the Google Technology User Groups -- regular meetups where local developers can get together to network and discuss, demo, and hack on Google's many developer offerings. From lightning talks in Mountain View, to App Engine hackathons in Tokyo, to lectures in Berlin, the GTUGs are a great place to meet fellow developers and learn (or teach) something new. At Google I/O, there were many folks eager to bring the spirit of the conference back to their hometowns by starting up GTUGs of their own. Since the conference ended, our list of current GTUGs has grown to include this 'baby boomer' generation of chapters. The following are all new groups looking for members and starting to set up their first events. If there's one near you, check it out! Let the organizers know you're interested; suggest topics for discussion and even offer to do a talk about your own experiences. Don't see a chapter near you? Start one! Join our GTUG managers mailing list. Other info at gtugs.org. 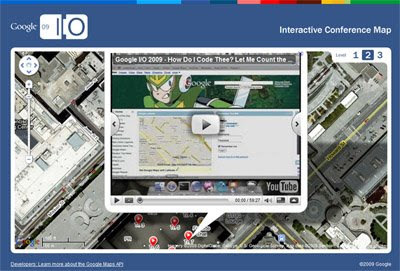 Google I/O Interactive Map: Now with videos + some Open Source goodness! Now that all the I/O session videos and presentations are live, we took the opportunity to mash up the videos with our interactive conference map to provide developers with an alternate way to navigate through 80+ keynote and session videos, and bring the action at I/O to life virtually. For example, here are videos of sessions that took place in Room 1 (click the tabs for Wednesday and Thursday sessions). And here's where the keynote sessions took place. Check out where we filmed interviews with I/O sandbox developers on their apps, technical challenges and business best practices. Now, hopefully you enjoyed using the map and are now thinking, "Cool, I want to do something like this for my next event!" (or your college campus, or such). If you are, then good news everyone, I've open sourced the interactive conference map and all relevant resources. Inside the project, you'll also find a how to article outlining the steps I went through to create the map. 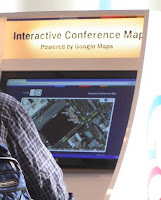 If you attended I/O, then I hope you enjoyed it and had time to stop by the conference map kiosk! If not, no worries, just make sure to check out the open source project and see if you can use the code and/or techniques in your next mapping project! and decided to share more of our learnings in a brief series of follow-up blog posts. This week, I'll talk about a few small things you can do to improve performance of your HTML5-based applications. Our focus here will be on performance bottlenecks related to the database and AppCache. There are hundreds of books written about optimizing SQL and database performance, so I won't bother to get into these details, but instead focus on things which are of particular interest for mobile HTML5 apps. Problem: Creating and deleting tables is slow! It can take upwards of 200 ms to create or delete a table. This means a simple database schema with 10 tables can easily take 2-4 seconds (or more!) just to delete and recreate the tables. Since this often needs to be done at startup time, this really hurts your launch time. Solution: Smart versioning and backwards compatible schema changes (whenever possible). A simple way of doing this is to have a VERSION table with a single row that includes the version number (e.g., 1.0). For backwards-compatible version changes, just update the number after the decimal (e.g., 1.1) and apply any updates to the schema. For changes that aren't backwards compatible, update the number before the decimal (e.g., 2.0) at which point you can drop all the tables and recreate them all. With a reasonable schema design to begin with, it should be very rare that a schema change is not backwards compatible and even if this happens every month or so, users should get to use your application 20, 30 even 100 times before they hit this startup delay again. If your schema changes very infrequently, a simple 1, 2, 3 versioning scheme will probably work fine; just make sure to only recreate the database when the version changes! Problem: Queries are slow! Queries are faster than creates and updates, but they can still take 100ms-150ms to execute. It's not uncommon for traditional applications to execute dozens or even hundreds of queries at startup – on mobile this is not an option. This will return all the entries we want, with the magazine entries first in increasing order of number of articles, followed by the book entries, in increasing order of the number of books. This is a toy example and there are clearly other ways of improving this, such as merging the Magazines and Books tables, but this type of scenario shows up all the time. There's always a trade-off between simplicity and speed when dealing with databases, but in the case of HTML5 on mobile, this trade-off is even more important. Problem: Multiple updates is slow! We'll get into more detail on triggers and how to use them in another performance post to come. Problem: Logging in is slow! Solution: Avoid redirects to the login page. App-Cache is great because it can launch the application without needing to hit the network, which makes it much faster and allows you to launch offline. One problem you might encounter though, is that the application will launch and then you'll need to hit the network to get some data for the current user. At this point you'll have to check that the user is authenticated and it might turn out that they're not (e.g., their cookies might have expired or have been deleted). One option is to redirect the user to a login page somewhere, allow him to authenticate and then redirect him back to the application. Regardless of whether or not the login page is listed in the manifest, when it redirects back to your application, the entire application will reload. A nicer approach is for the application itself to display an authentication interface which sends the credentials and does the authentication seamlessly in the background. This will avoid any additional reloads of the application and makes everything feel faster and better integrated. Problem: AppCache reloading causes my app to be slow! Solution: List as few URLs in the manifest as possible. In a series of posts on code.google.com, we talked about the HTML5 AppCache manifest file. An important aspect of the manifest file is that when the version gets updated, all the URLs listed in the file are fetched again. This happens in the background while the user is using the application, but opening all these network connections and transferring all that data can cause the application to slow down considerably during this process. Try to setup your application so that all the resources can be fetched from as few URLs as possible to speed up the manifest download and minimize this effect. Of course you could also just never update your manifest version, but what's the point of having rapid development if you never make any changes? That's a brief intro to some performance considerations when developing HTML5 applications. These are all issues that we ran into ourselves and have either fixed or are in the process of fixing in our application. I hope this helps you to avoid some of the issues we ran into and makes your application blazing fast! We plan to write several more performance related posts in the future, but for now stay tuned for next post where we'll discuss the cache pattern for building offline capable web applications. On April 7th, Google launched a new version of Gmail for mobile for iPhone and Android-powered devices. We shared the behind-the-scenes story through this blog and decided to share more of our learnings in a brief series of follow-up blog posts. This week, I'll talk about a few small things you can do to improve performance of your HTML5-based applications. Our focus here will be on performance bottlenecks related to the database and AppCache. Loops: Nicholas points out that for-in and for each loops should generally be avoided. Although they provide convenience, they perform poorly. The choices when it comes to loops are for, do-while, and while. All three perform about the same. The key to loops is optimizing what is performed at each iteration in the loop, and the number of iterations, especially paying attention to the previous two performance recommendations. The classic example here is storing an array's length as a local variable, as opposed to querying the array's length property on each iteration through a loop. DOM: One of the primary areas for optimizing your web application's interaction with the DOM is how you handle HTMLCollection objects: document.images, document.forms, etc., as well as the results of calling getElementsByTagName() and getElementsByClassName(). As noted in the HTML spec, HTMLCollections "are assumed to be live meaning that they are automatically updated when the underlying document is changed." Any idea how long this code takes to execute? This code results in an infinite loop! Each time a div is appended to the document, the divs array is updated, incrementing the length so that the termination condition is never reached. It's best to think of HTMLCollections as live queries instead of arrays. Minimizing the number of times you access HTMLCollection properties (hint: copy length to a local variable) is a win. It can also be faster to copy the HTMLCollection into a regular array when the contents are accessed frequently (see the slides for a code sample). Another area for improving DOM performance is reflow - when the browser computes the page's layout. This happens more frequently than you might think, especially for web applications with heavy use of DHTML. If you have code that makes significant layout changes, consider making the changes within a DocumentFragment or setting the className property to alter styles. There is hope for a faster web as browsers come equipped with JIT compilers and native code generation. But the legacy of previous, slower browsers will be with us for quite a while longer. So hang in there. With evangelists like Nicholas in the lead, it's still possible to find your way to a fast, efficient web page. Daniel Holevoet outlined all the ways Google uses social technologies, highlighting those services which allow developers to extend them using the OpenSocial APIs. During his talk, Dan announced the new support for OpenSocial gadgets in Google Calendar, which include hooks into a calendar-specific API for accessing the currently-selected date range. Dan demonstrated the Quartermile OpenSocial application he wrote along with Arne Rooman-Kurrik and showed how the app could be used for different purposes across iGoogle, Gmail and Google Calendar and talked about how it could be used on any website via Google Friend Connect or on traditional social networks supporting the OpenSocial APIs. Of course, Dan didn't get to cover all the exciting news about Google's social initiatives during this talk-- a real-time gadgets API was announced during the Developer Sandbox! Jonathan Terleski (lead designer on Google Friend Connect) and I presented this session on best practices for building Google Friend Connect (GFC) gadgets for the millions of websites and blogs using GFC today. We gave a brief overview of OpenSocial, followed by some design principles and a basic framework to think about when building GFC gadgets: what are the social objects, how do users contribute them, and how to users consume them? In the last part of the talk, I discussed how to use page context in your gadgets for content, skinning and language while showing some small bits of code to accomplish each. Most importantly, we announced the opening of submissions to the Google Friend Connect gadget directory and support for OpenSocial 0.9 in GFC gadgets. In this talk, Arne Roomann-Kurrik and Chris Schalk talked about how they built the Plane Crazy site for flying enthusiasts and the Chow Down site for restaurant connoisseurs as example sites demonstrating how to integrate Google Friend Connect with existing login systems and add social functionality using the REST and RPC APIs. While these sites were built on top of Google App Engine (using Java and PHP), they talked about the other client libraries and raw protocols available for similar integrations. The Chow Down site is already open-sourced, and the Plane Crazy site will be shortly. Patrick Chanezon led this session along with Shivani York, Henry Chan and Srivaths Lakshmi of TIME.com and Paul Berry of HuffingtonPost talking about how they integrated Google Friend Connect into their sites. Both TIME.com and HuffingtonPost used Google Friend Connect to create social lists where you rank the top items from the news, such as "Top 10 Movie Catchphrases" and "The World's Most Famous Swimsuits." Khris Loux, of JS-Kit, concluded the session by addressing why it's a good idea to integrate with Google Friend Connect and how the web is enhanced by having open API access to social data. Shawn Shen and Chewy Trewhalla, Developer Advocates at Google, and Gerardo Capiel, VP of Product Management for the MySpace Open Platform, led this session showing how developers can make a living by building social apps. Virtual currencies, the recent OpenSocial extension proposal for a virtual currency spec and implementations on hi5, 51.com and other networks were discussed. In talking with a wide variety of developers and preparing this session content, our team learned even more about this industry, and we hope you can too. How do you use standard web optimization techniques in combination with existing and new features of OpenSocial 0.9 to develop a fast social application which scales efficiently? Arne Rooman-Kurrik and Chris Chabot examined this question in great depth. They took the Quartermile application which they developed and dived into the bandwidth, cpu and monetary savings achieved by applying a variety of optimizations--from image spriting, to data pipelining and proxied content. From the naive implementation to the optimized implementation, they showed how you could improve latency by nearly 70% and drastically reduce the cost of hosting a social application. Joseph Smarr, Chief Platform Architect at Plaxo, led this standing-room-only session about the current state of the social web and how "The Web is now social... and the Social Web is now open." He recapped progress made in the last year, with the emergence and increasing adoption of a variety of technologies which make up the Open Stack: Open ID, XRDS-Simple, OAuth, Portable Contacts, OpenSocial. He gave many demos, including demonstrating the death of the "password anti-pattern" leading to a 92% conversion rate on users importing their contacts from sites supporting OpenID+OAuth and Portable Contacts. Many people today have a mobile device which has internet access, and they probably use those devices as much (if not more!) than they use their computers. I explored the different ways to use social data from the web to enhance the experience users have with their mobile devices. I demonstrated and dove into the code of three different types of apps -- pure web apps targeted at mobile devices, a web app which uses some native GPS functionality via Google Gears and adding a social scoreboard to the "Divide and Conquer" open source native Android application. I then spoke a bit about the future of mobile development and how the features available between native applications and web applications are beginning to merge with the new HTML5 and W3C standards which provide access to native functionality such as databases, app caches and GPS location data. Social networks are typically thought of as tools for personal communication, but they've increasingly become important in the enterprise world as well. Chris Schalk of Google led this panel along with representatives from IBM, Salesforce.com, Oracle, eXo, SAP and Atlassian to share the ways enterprises have used OpenSocial technology outside of and behind the firewall. There's a wealth of new information in these presentations which were all prepared especially for Google I/O, including several new announcements. The presenters also developed quite a bit of code for Google I/O, which we'll be releasing as Apache-licensed open source projects over the next couple weeks. Stay tuned to the OpenSocial blog for those releases. I had a great time at Google I/O -- meeting lots of developers from around the world who are interested in developing applications that use social data. In addition to building web applications for traditional social networks like orkut, MySpace and hi5, developers are also looking at enterprise and mobile applications which take advantage of the social graph, gadgets for Google's platforms like iGoogle, Google Calendar and Gmail, and gadgets for the 5 million websites and blogs powered by Google Friend Connect. We had some important questions raised in many of the sessions and also in the fireside chats with containers and app developers. It was exciting to see the whole OpenSocial ecosystem come together to discuss the current status and progress of social technologies, as exemplified by the I/O Developer Sandbox. 2009 has been a busy year for the App Engine team, but all along we've looked forward to Google I/O and the excitement it brings to Google's developer community. At I/O last year, App Engine was brand new and many attendees were just getting familiar with the project. Well, what a difference a year makes - this year, in addition to sharing new information about our project, we got to learn about an amazing host of App Engine projects from you, our developers! First, the big news - we are excited to announce open signups for our Java language runtime. During Wednesday's keynote, Engineering Manager Kevin Gibbs and Product Manager Andrew Bowers demoed the combined power of App Engine and GWT, all with easy deployment from the Eclipse IDE. If you've not tried our new language yet, please head over to the Admin Console to signup, then download the SDK and get programming. The engineers behind Google App Engine for Java presented two sessions. First, Toby Reyelts and Don Schwarz introduced the new runtime with App Engine: Now Serving Java, including details of how our Java language layer exposes the power of Google's infrastructure. Be sure to check out the interactive game they demo'd with audience participation! Digging a bit deeper, Max Ross showed us The Softer Side of Schemas - how he mapped Java Persistence Standards to App Engine's datastore. In addition to the new Java runtime, App Engine developer Brett Slatkin previewed some eagerly anticipated functionality: offline tasks. In his talk Offline Processing on App Engine: a Look Ahead, Brett revealed the first few milestones of App Engine's plan for offline processing with our upcoming Task Queue API. Leveraging the power of a web hook (an HTTP request body and URL) as the fundamental unit of execution on the web, this new API will allow you to organize and enqueue tasks for efficient background processing. Stay tuned to the App Engine blog for this feature's launch. The App Engine team is always eager to share information about our infrastructure and how things work under the hood. Alon Levi kicked things off Wednesday morning with From Spark Plug to Drive Train: Life of an App Engine Request, in which he showed new information about how an application's incoming requests are received, scheduled, and executed by App Engine. Ryan Barrett presented some of the theoretical, yet practical challenges faced by the App Engine team with Transactions Across Datacenters (and Other Weekend Projects). Finally, Brett Slatkin took the stage once again, with Building Scalable, Complex Apps on App Engine, to give you insights on advanced data structures and algorithms. The Walk Score team shared their experience combining App Engine with other products in App Engine Nitty-Gritty: Scalability, Fault Tolerance, and Integrating Amazon EC2. Ola Bini gave a language implementor's view of our new Java runtime with JRuby and Ioke on Google App Engine for Java. Daniel Wilkerson presented distributed database theory in A Design for a Distributed Transaction Layer for Google App Engine. Last but not least, more partners joined our Developer Sandbox to share their experience building projects on Google App Engine: 3scale, Best Buy, BuddyPoke, EZAsset, Gigapan, LifeAware, Salesforce.com, SpringSource, and ThoughtWorks. Thanks for making this year's Google I/O a fantastic success! We have much more in store for 2009, so be sure to watch the App Engine blog for updates! at Google I/O last week. It was a treat to meet developers face to face and share stories about how things like Google App Engine, gadgets, GWT, Enterprise Search, and HTML 5 are impacting the industry's move to cloud computing. We were also pleased to announce Google Apps Script, a new feature that allows customization and automation in Google Apps, starting with spreadsheets, and to see the positive press coverage it has received. The reality is that despite a formal "enterprise" track, the majority of the sessions were interesting and relevant to commercial developers, particularly Google Apps developers, who are rapidly uncovering a diverse set of commercial opportunities using these developer tools. This is something we want to continue to spread the word about! Practical Standards-based Security and Identity in the Enterprise: Eric Sachs gave an overview of how Google is incorporating today's open identity and authorization standards into both consumer applications as well as enterprise software. Eric demonstrated inter-service communication using OAuth: from extranet to intranet, from platform to platform, and even from Google App Engine to Google App Engine. Growing a SaaS-based services business around Google Apps: Jeff Ragusa of Google and Daniel Jefferies of Newmind Group gave a talk on how system integrators and developers can partner with Google to build a strong business reselling Google Apps and complementary services. Jeff highlighted the the myriad opportunities that emerge when the money spent on licenses, maintenance and upgrades can instead be spent on solving specific business problems and building custom apps an gadgets. Daniel, a Google Apps Authorized Reseller, talked about his experience bringing cloud computing to his customers. Building Scalable, Complex Apps on App Engine: Brett Slatkin gave an informative presentation on the advanced techniques and data structures developers can leverage to build complex apps with App Engine. Areas of discussion included list properties and merge-joins, and how developers can use these tools to maximize performance of their apps. Salesforce, Appirio and ThoughtWorks on App Engine for Java: Ron Hess of Salesforce and Iein Valdez of Appirio presented Connecting The Clouds: Integrating Google App Engine for Java with Force.com, and announced a new open source SOAP library for App Engine that helps connect App Engine apps to Force.com apps. Martin Fowler and Rebecca Parsons presented a session titled ThoughtWorks on App Engine for Java: An Enterprise Cumulonimbus?, which provided an overview of App Engine and the move to cloud computing from the perspective of larger enterprises. Using the Google Secure Data Connector to Access Behind-the-Firewall Data from Google's Cloud: In this session, Jun Yang of Google showed how enterprises can bring a behind-the-firewall relational database into Google Apps using the Google Secure Data Connector and Google Feed Server. Jun demonstrated how developers can do this without the need for special code to access the SQL data or complex firewall configuration. We hosted a mixer for enterprise developers and IT decision makers on the first day of I/O, and were thrilled at the turnout. The event was our first face to face outreach to commercial developers, covering all Enterprise product lines and touching on several recent developer announcements like Google Apps Script and the Google Apps Reseller program. 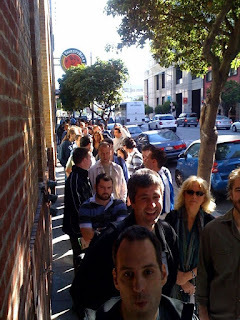 No, this is not people queuing up for free Android phones, just the line for the Enterprise Mixer. All told, a great two days thanks to all of you. Since we're just getting started with tools and topics of interest to enterprise developers, please stay in touch. We have more tools and APIs on the way. The easiest way to do that is to subscribe to our Solution Provider announcements, and if you're tweeting, follow us on Twitter at GoogleAtWork. The Google Enterprise team was really energized to see the strong turnout for the 8 enterprise-track sessions at Google I/O last week. It was a treat to meet developers face to face and share stories about how things like Google App Engine, gadgets, GWT, Enterprise Search, and HTML 5 are impacting the industry's move to cloud computing. We were also pleased to announce Google Apps Script, a new feature that allows customization and automation in Google Apps, starting with spreadsheets, and to see the positive press coverage it has received. Another Google I/O has come and gone, and speaking personally I think it's going to be hard to top this year's conference. Free Android unlocked developer devices and the unveiling of a very cool new product built with developers in mind? I already don't envy the planning team taking on next year. There was a ton of Google Web Toolkit (GWT) related content this year, including an incredibly nice shout-out from Lars Rasmussen during the Google Wave keynote - if you haven't heard, Google Wave is built using GWT so if you want some inspiration as to what's possible, check out the keynote. GWT Can Do What? A Preview of Google Web Toolkit 2.0: Start thinking about how you will take advantage of new features like runAsyc in the next version of Google Web Toolkit. Bruce Johnson, Co-creator of GWT, goes into the details of what's coming and the philosophy behind the new features. Google Web Toolkit Architecture: Best Practices for Architecting your GWT App: A common question people ask is how to architect a GWT app. Ray Ryan discusses real-world learnings and patterns from the Google AdWords team and elsewhere which you can use in your apps. Measure in Milliseconds: Performance Tips for Google Web Toolkit: Want some best practices for speeding up your app? Kelly Norton shares a few concrete issues and how to solve them. Effective GWT: Developing a Complex, High- performance App with Google Web Toolkit: Alex Moffat and Damon Lundin from Lombardi are back again for a second year at Google I/O. Similar in theme to Ray Ryan's talk above, but with additional perspective and content, they'll take you through how they've successfully architected Lombardi Blueprint. I recommend watching both if you are laying out a new GWT app, or refactoring an existing one. The Story of your Compile: Reading the Tea Leaves of the GWT Compiler for an Optimized Future: What if your app isn't as fast as you like it to be? While GWT tries to make your app as optimized as possible when you drive it off the lot, applications sometimes need to be tuned for racing by the developers themselves. Lex Spoon and Bruce Johnson talk about tools and techniques for understanding what's going on with your code and how to use that information to optimize your app. Progressively Enhance AJAX Applications with Google Web Toolkit and GQuery: Ray Cromwell, from Timefire is one of my personal favorite speakers and commentators on GWT and web development. When he broke out his horse race demo in this session to measure performance deltas between different JS libraries, I knew why. Ray takes JQuery's power approach to manipulation and implements it in GWT. Learn about Ray's tool and how you can use this in your own projects to give designer's tools they can use directly in the HTML, without coding Java. Building Applications with Google APIs: Did I mention Ray is an entertaining technical speaker? The title of this session, as Ray noted, doesn't do it justice. Related to GWT, this session outlines how he's used Google APIs and tools together to create an amazing integrated experience at Timefire. His demonstration of the interactive graph that syncs with the YouTube video is very compelling. Want to dispute Al Gore's claim of carbon emissions? Add your own dataset to the graph via a comment. Impressive. We had a great time meeting many of you at I/O. Many of us were on hand, and talked to a lot of 'familiar email addresses' - it's nice to make that familiar faces. For those of you who didn't make it to I/O or want to revisit the GWT sessions, we hope you enjoy the session videos and presentations!